The twisted stars of the '80s trading card sets celebrate 30 years of adorable absurdity in IDW's new monthly series. Back in 1985, the minds over at Topps decided to poke fun at the Cabbage Patch Kids toy phenomenon by releasing a set of trading cards that warped the cute little dolls into strange, twisted, and yes, gross, caricatures with names like Up Chuck, Potty Scotty, and Oozy Susie. Created by Pulitzer Prize-winning cartoonist Art Spiegelman, the Garbage Pail Kids debuted back when trading cards was at an all-time high. Its tongue-in-cheek take on pop culture struck a chord with kids and adults (though not usually teachers), leading to everything from posters and buttons, to an animated TV show, and even a live action motion picture. Now, nearly thirty years later, the junkyard juveniles are making their way to the comic scene for the first time with a brand new anthology series, courtesy of IDW Publishing. "As a child of the Eighties, I was at ground zero for the Garbage Pail Kids phenomenon," series editor Denton J. Tipton said. "The profoundly irreverent stickers spoke directly to the rascal inside each and every one of my classmates, and helped us drive our teachers to the brink of insanity. I couldn't be more happy to be working with some of the giants of alternative comics to push the buttons of an entirely new generation of educators, many of which likely remember when the poo-covered sneaker was on the other foot." 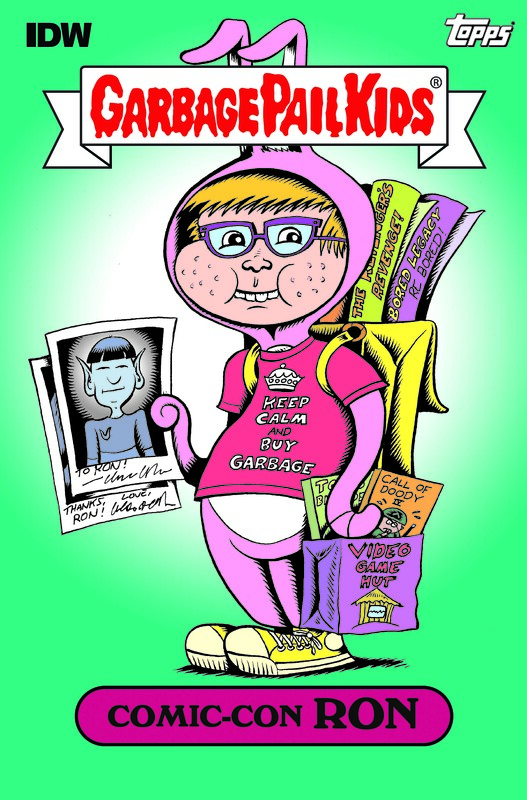 Hate cartoonist Peter Bagge, who provided art for the all-new character "Comic-Con Ron" (shown at right), will be a part of the new series, which will bring together various writers and artists, including many of Topps' official Garbage Pail Kids artists. Each issue will expand on the GPK universe, spotlighting new and classic characters as part of an anthology of loosely connected stories. Current plans are for the Garbage Pail Kids comic to hit store shelves next year, coinciding with the franchise's 30th anniversary.